O.U.P.S will be notified and all utilities will be properly located prior to excavation. The perimeters of the area(s) to be excavated will be saw cut to enhance compaction, appearance and longevity. We will excavate the existing decayed block or pre-cast concrete catch basin, and properly dispose of all materials at a legal dumping site. 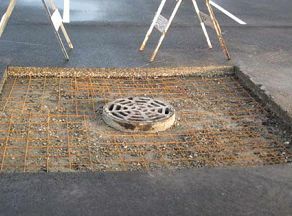 A pre-cast concrete catch basin with necessary adjustment rings will be installed and connected to the existing drainage lines. The existing cast iron frame and lid will be reinstalled on the new basin and reset at the proper height for proper drainage. The excavated area(s) will be backfilled with crushed aggregate, leveled, and compacted. We will then furnish and install a new 6” – 8” concrete casing to match existing grade. 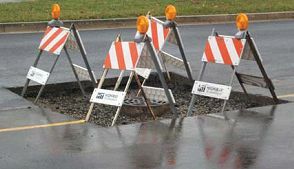 We will excavate, as necessary, to remove the existing catch basin frame(s). We will then furnish and install the necessary size frame,flat top lid and/or adjustment rings to reset level(s) for proper drainage. The excavated area(s) will then be backfilled and leveled with a 6” – 8” concrete casing to form a smooth surface and solid, protective barrier.